Surfing in Taghazout - Waves for every level! Since the 60’s surfers from all over the world are travelling to Taghazout for the fantastic surf. The former fishing village has experienced a huge tourist growth. Especially since 10 years the number of surf tourists has increased enormously. And these surfers do not come for nothing, the fantastic waves, especially in the winter season the waves can become high. Taghazout offers all kinds of waves. The special thing about Taghazout are the relaxed vibes, and the hippie style that stuck out of the 60’s. Time seems to have stood still here! Taghazout is found in the south of Morocco. Taghazout is located 20 kilometers north of Agadir. Where the desert, argan forests and Atlas Mountains meet with the Atlantic Ocean, a very special piece of nature can be found. Taghazout is located against the mountains. And recently the road from Agadir has improved well. The Atlantic Ocean brings fantastic swell to this coastal village. There is a swell throughout the year making it possible to surf for beginner surfers all year round. From October, the swell will become stronger and all surf spots around Taghazout will begin to work. This is the time that intermediate and advanced surfers should visit Taghazout. Taghazout has the most perfect right-handed waves you will ever see! A great benifit of surfing around Taghazout is that the area offers a great variety in different surf spots. There is a surfspot for every level that works. The surf spots also become less overcrowded due to the large offer. A disadvantage of surfing close to Taghazout is that the water is not always clean. Many surfers who stay in Taghazout get sick by the water. So be careful, and it is therefore better to choose a surfspot that is located a bit out of the village. Right on the coast of Taghazout: Hash Point is perfect for intermediate surfers. South of Taghazout is Panorama point and Panorama beach located. Panorama beach is excellent for the beginning surfers. To the north of Taghazout you will find many surf spots such as Anchor Point, La Source, and Killer Point. 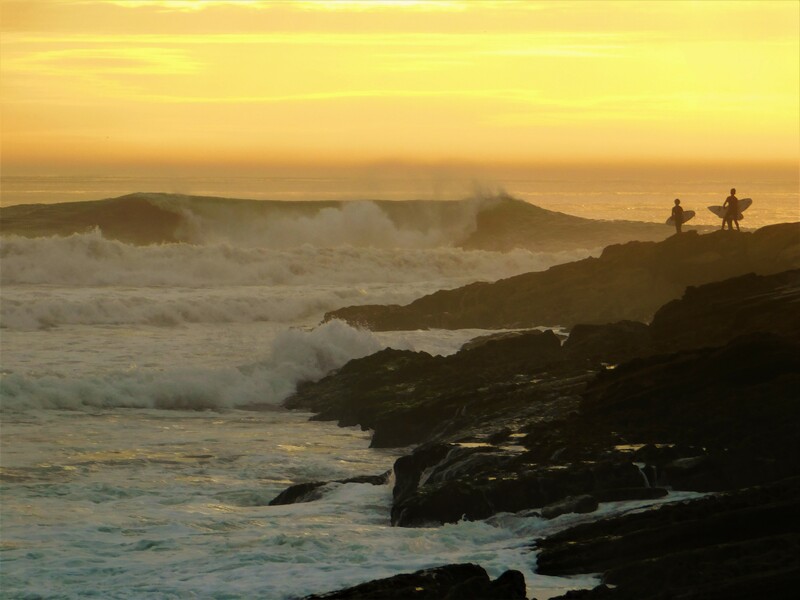 In a circumference of 30 minutes drive you will find at least 25 different surf spots! Besided surfing there is a lot things to do and a lot of places to discover. Morocco has a rich culture and the nature around Taghazout is stunning. 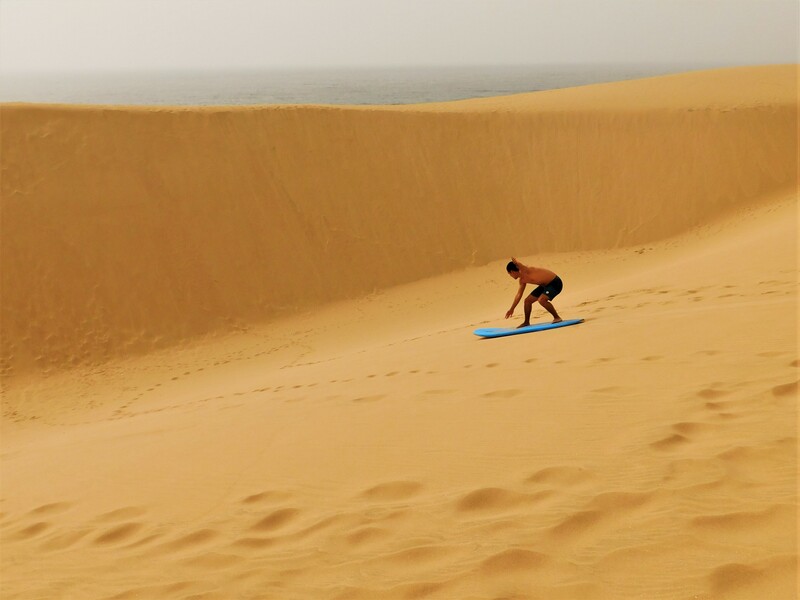 Join our expeditions to Paradise Valley, visit the traditional souks of Agadir or go sandboarding in the small Sahara. What is the best surfseason in Taghazout? Every season in Morocco has its own characteristics. You’ve heard that the winter season is good for the surfers and the summer season better for the novice surfers. But there’s more! The high season among the surfers is over and the waves are getting smaller again. The tempratures are increasing. It is still fantastic for the intermediate surfer! The novice surfer can also find enough waves to learn how to surf. The beaches are full of beachgoers. Few surfers can be found. Nevertheless, you can learn to surf perfectly on a number of surf spots! For the intermediate surfer it is more difficult to find different surf spots. Often the intermediate surfer and the advanced surfer will be on the surf spots: Anza and Tamri. The tempratures can rise, but due to a sea fog that hangs in the summer, the temperatures will remain pleasant. The surf season starts again, and the surfers come back. As the year progresses, the chances are increasing on a high swell. The waves roll in continuously and every day pro-surfers are training. Sometimes a monster swell rolls in. One thing is certain, the surfer will certainly be happy during this season! There are also a number of spots for beginners who offer smaller waves. 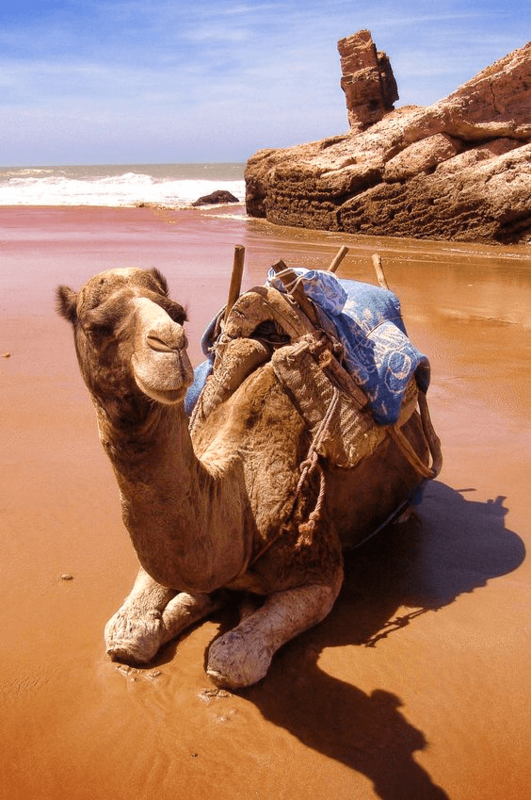 What is the best way of transport in Taghazout? No worries, there are enough transportation options to travel from A to B around Taghazout. 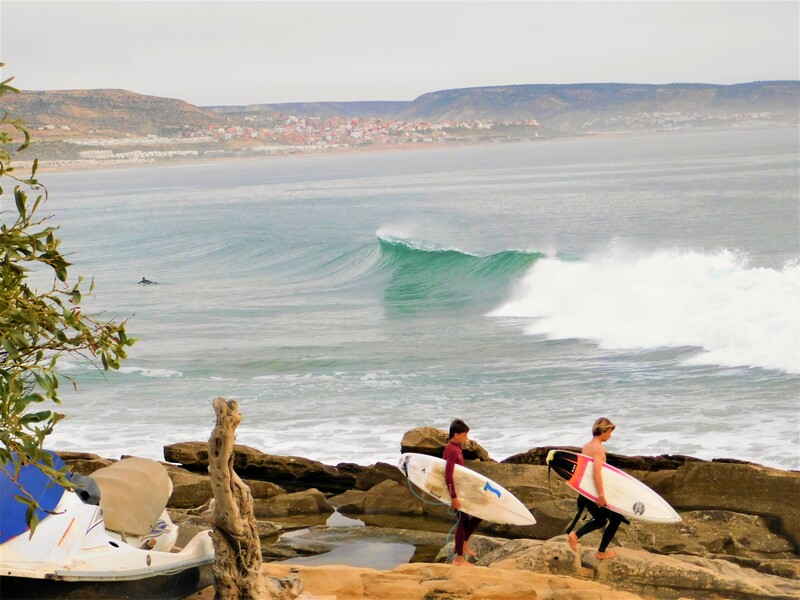 Several surf camps such as Surf Paradise Morocco offer transfers to the best surf spots in the area. Surf Paradise Morocco can also arrange your transfer from Agadir or the airport. Do you travel independently? In Taghazout and Tamraght you can do a lot on foot. Local buses run from village to village for which you only pay around 0.5 euros. There are also many shared taxis in the area with which you can transport yourself for a cheap price. If you are traveling with children, we advise you to stay in Tamraght. Tag salt is not always clean and the seawater is not swimable. Taghazout is full of young travelers who love a party, so at night it can be noisy. Against this Tamraght is cleaner, less touristy and quieter. Many stories are about women traveling as a single traveler to Morocco. In large cities such as Marrakesh and Fes, women can experience various problems. In contrast, traveling to Taghazout and Tamraght as a woman is no problem at all. The locals are accustomed to the many tourists, and there are mostly surfers living in the villages. As a woman alone you can expect a chat from the local gentlemen but they will not bother you undesirably. Especially if you stay in a surf camp where everything is organized and you travel with a guide + group, you will not experience a problem as a woman and it is also very nice! You can attract everything, and it is no problem to wear shorts / bikini. This package is great for those who can’t get enough of surfing. During this one week intensive surfing traning you will learn to surf in no-time! Explore Morocco on the most adventurous way possible! This holiday is active and varied with a lot of different activities! Do you want to be more flexible? Book your accommdation only and decide to add activities to your program that you like!